SUBHEAD: The Planning Dept and Opticos Design Inc has presided over a complete failure to produce a new plan for our future. Image above: Page 37 from Kauai Plan Closing Workshop on Hanapepe-Eleele showing the expansion of the Urban Neighborhood center, Neighborhood General, Neighborhood Edge and Residential Community "doubling" in area, indicating a doubling of population planned for this area. this will eliminate vast areas of the best potential acreage for growing food near the current residents of Hanapepe-Eleele. From (http://plankauai.com/wp-content/uploads/2015_1104_HanapepeEleeleClosing-1.pdf). When I moved to Hawaii in 2000 Kauai County issued the Kauai General Plan. It was produced with community participation in 1998-99 and was actually a pretty good effort. It can still be found on the County website at (http://www.kauai.gov/Government/Departments-Agencies/Planning-Department/Long-Range-Division/The-Kauai-General-Plan). The Community Values were formulated by the Citizens Advisory Committee, using input from 25 outreach meetings with a variety of community, business and public interest groups. Protection, management, and enjoyment of our open spaces, unique natural beauty, rural lifestyle, outdoor recreation and parks. Conservation of fishing grounds and other natural resources, so that individuals and families can support themselves through traditional gathering and agricultural activities. Access to and along shorelines, waterways and mountains for all. However, access should be controlled where necessary to conserve natural resources and to maintain the quality of public sites for fishing, hunting, recreation and wilderness activities valued by the local community. Recognition that our environment IS our economy, our natural capital, the basis of our economic survival and success. Balanced management of our built environment, clustering new development around existing communities and maintaining the four story height limit. Diverse job and business opportunities so that people of all skill levels and capabilities can support themselves and their families. Government that supports and encourages business. Balanced economic growth development promoting providing good jobs and a strong economy, without sacrificing our environment and or our quality of life. Respect and protection for the values and rights of our many cultures, in compliance with our laws and responsibilities as citizens. Preservation of our cultural, historical, sacred and archeological sites. Appreciation and support for the traditions of the Native Hawaiian host culture and the many other cultural traditions and values that make up the Kauai community. The Vision describes conditions on Kauai in the year 2020 and is written from the standpoint of that point in time. It reflects not only the Community Values but also the issues and opportunities foreseen by community members. The Vision expresses what Kauai should strive for, in the context of realistic conditions as they are understood in 1999. The Vision is presented first in summary, then in a longer narrative. We envision that in 2020 Kauai will be . . .
and an island whose government supports the labor force and small business owners, firmly holding to essential policies and regulations while eliminating unnecessary red tape. In fact the Kauai General Plan 2000 was too good for the land speculators and project developers intent on making a killing in Kauai real estate aided and abetted by county employees and public servants. So, as a result, the General Plan was put on a shelf and ignored. Ten years after the work done to put together the General Plan, a wave of dicey real estate deals were frothing through the American economy. Kauai had more than its share. Over ten thousand units of speculative condos, timeshares, and residents were moving forward in places like Poipu and Kapaa. Fortunately for those on Kauai who don't live here for the nightlife, shopping opportunities and traffic; that real estate bubble crashed before totally engulfing Kauai with suburban sprawl like Mililani, Oahu or Kihei, Maui, where traffic congestion and national franchises rule the land. The intent of the new Zoning Code was to not only update and modernize the Code, but also to create regulations that reinforce the community's desires as expressed in the Regional Plan to promote Sustainable Development practices and Smart Growth principles. For those of you who don't know planning jargon Sustainable Development translates to DEVELOPMENT and Smart Growth translates to GROWTH. When I looked at the current effort that Opticos Design that is detailed online the first thing that caught my attention was the url www.plankauai.com. that's a commercial domain. Not a ".org" or even more appropriately a ".info". The ".info" is for credible resource websites ("org".edu" and ".gov." are other non commercial designations). Whereas the ".com" (and ".biz") are reserved for commercial enterprises. Why would an online public planning effort be a commercial enterprise? The Plan Kauai website seems to avoid telling you what it is really up to. There is a lot of "eye candy" layout and graphics and "feel good" pictures of local sites and residents. But the planning substance is hard to find, incomplete and poor in quality. 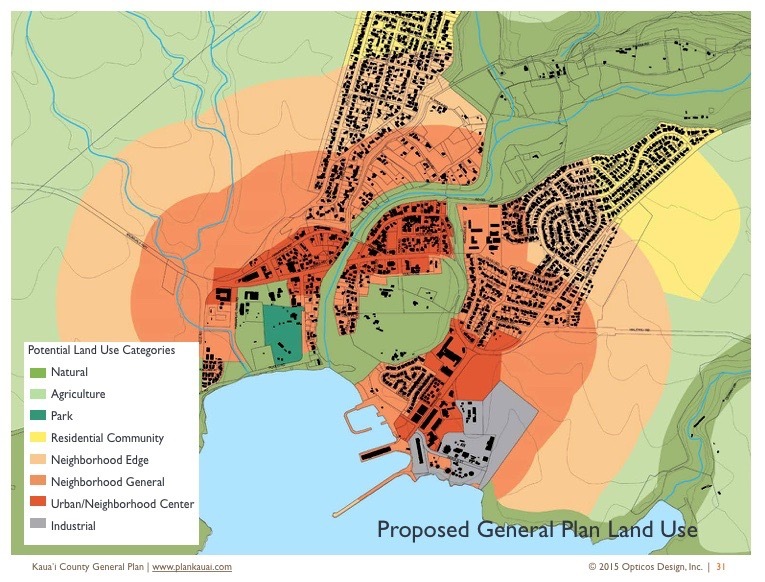 A simplistic concept of concentric levels of density around core "urban centers" has been used to explain and rationalize filling out every community on the island with denser development. Some of these "urban centers" are not much more than four corners with a stop sign. Opticos Designs website reports on the planning effort are not up to date. Below are links to four of the latest planning documents for different parts of the island. I challenge Kauai residents to find this information on the Plan Kauai website. Obviously eastside Lihue-Hanamaulu and the southside Koloa-Kalaheo areas are not listed below (and it seems unavailable to the public for review this late in the game). By the way, each of the PDF files below are more than half identical boilerplate for the first 30 so so pages. I reviewed the final Kauai Plan Closing Workshops proposals this morning. I looked in some detail at the Westside, because I know it best. That includes Hanapepe-Eleele, Waimea-Kekaha. As far as I am concerned the plans are a complete failure. They do not address the future, but look to the trajectories of the past and decided the best course was to continue on the same path we are on and step on the gas. Development, Growth, Suburbanization are their guides and Sustainability, Self-reliance, Food Security are unmentioned. Also unmentioned are Global Warming, Climate Change and Ocean Rising. Even pretending this is a serious effort on the part of our Planning Department is an insult to planning. I’ll give you example closest to my home of a “total failure” of planning in Hanapepe Valley. The area I live in is designated by the State of Hawaii as “Rural”. Not “Urban” or “Agricultural”. It is heavily wooded and has acres of taro, pasture, and small farms. There are residences and junkyards. Food is produced here, birds have forested refuge and there are horses, goats, pigs, domestic chickens and hunting dogs. Much of this would not be happening in a urban or even suburban development. The General Plan proposal for the area I live in is for filling in more residential suburban development like Hanapepe Heights and Eleele. Both totally unsustainable living areas. This plan if implemented would destroy the old Hawaiian style way of living in a valley in Hawaii. The motto of the previous Kauai Plan was "Keep Kauai rural!” Obviously, that idea was thrown under the bus by the Planning Department. I recommend the Sierra Club reject this update of the Kauai General Plan. 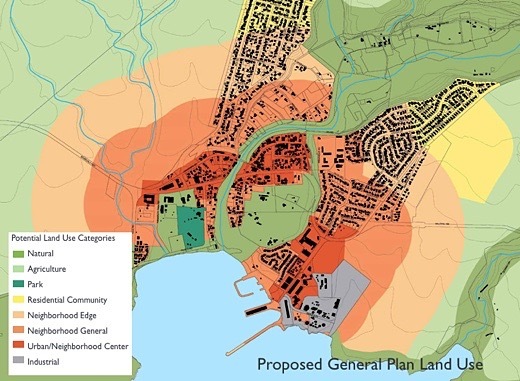 In the case of where I live in Hanapepe-Eleele this planning approach would result in doubling the developed area and population of the community in 20 years. I think if this criteria is used throughout Kauai for planning the island could not be self-sustainable. Moreover, in the future when imported fresh vegetable and frozen food are no longer routinely available from the mainland our outer islands of Hawaii will be required to not only sustain themselves but also support the currently unsustainable population of Oahu. Not if, but when the current model of international global marketing fails, we in Hawaii will greatly regret doubling the needed carrying capacity of our islands. Kamaaina (people raised locally) translates in Hawaiian to the "fruit of the land". Hawaiian culture places human communities a subset of the local watershed based biosphere. or "ahupuaa". Nature cannot be a subset of human activity. That way lies apocalypse.